Our training and accreditation process is focused on providing you with a complete system and process for the recruitment, development and retention of individuals, teams and organisations. The training will ensure you have the knowledge, skills and tools you need to be a World’s Best Accredited Practitioner. You will be highly skilled in using DISC in a wide array of situations and applications. We train “real world” process. You see, we believe accrediting someone in a psychometric instrument isn’t just about the theory and the instrument interpretation. Unfortunately however, this is often all you get. Of course, our training covers this but that’s not where it ends. We train thoroughly in the complete process – theory, interpretation, advanced analysis, project management, prebriefing, debriefing, conducting workshops, various users, implementation, what to do and what not to do. Accreditation is obtained by attendance at an intensive two day course. 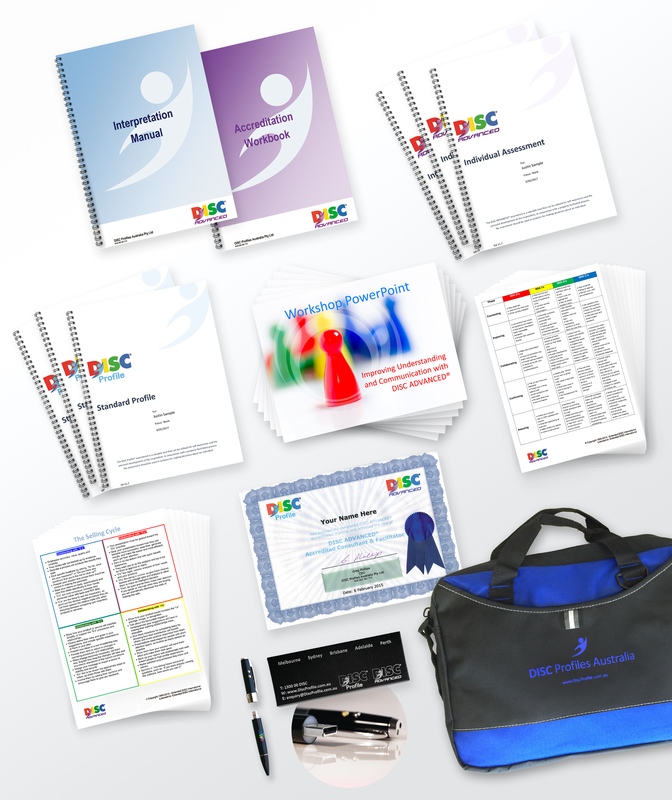 The supplied resources are comprehensive with significant printed materials and a USB Flash Drive loaded with resources — even Powerpoint presentations to run workshops, so there are no other modules or kits to purchase. You will be provided with access to our ongoing support program. We are always available by email and phone for ongoing support – free. Aside from obtaining the necessary knowledge for understanding how to use DISC Profile® and DISC ADVANCED® and thus gain accreditation, you will also learn how to successfully facilitate the process, effective debriefing and how to conduct workshops. Upon completion of the accreditation course you will be presented with a certificate qualifying you as a “DISC ADVANCED® Accredited Consultant”. The training is intensive and as such, participant numbers are limited, so the courses sell out before the closing date. It is therefore best to register as early as possible. Be aware that other companies acting as agents for overseas suppliers exclude some resources from their accreditation training, which have to be purchased separately. These often cost thousands of dollars more. With “The Home of DISC Profile® in Australia”™, everything is included, right down to a laser pointer! There is no further expenditure required for facilitator kits, reading guides, application libraries, modules, further training packages or resource material. In fact, when we update materials, PowerPoints etc. they are automatically supplied to previously Accredited Consultants free – forever. Local phone support line for unrivalled ongoing support and advice for your future reports, projects etc. ''This is great. With others you always have your hand in your pocket buying something so you can do your job."